Don't Rosin Your Bow Every Day! Some of you will probably be looking at the page saying, but I thought rosining my bow was part of getting ready to play. Making sure your bow is properly rosined is part of getting ready to play. I have heard teachers say that you only need to rosin your bow thoroughly every fifth time you play. That seems reasonable to me. What we are trying to do with the rosin is make the bow hair sticky enough that it catches the string to make it vibrate. Too much rosin can actually create a situation where the string does not vibrate cleanly, and the tone produced is unpleasant. Also, too much rosin means that you are actually depositing rosin on the belly of the instrument, the fingerboard and the bowstick. This creates a dirty violin which needs to be cleaned. All you are doing there is wasting your rosin! 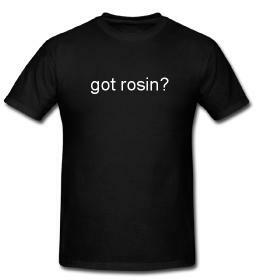 So how much rosin is enough? How do I know if I have too much rosin? I like to rosin my bow until I see a nice smooth color on the hair. Then I turn the bowstick toward my hand and tap it firmly against my hand two or three times to knock off any excess rosin dust. How often do I suggest rosining a bow? Honestly, I rosin my bow every time I play. It is just a mental thing as part of my preparation BUT I ONLY TAKE TWO OR THREE STROKES WITH THE ROSIN. Having experimented with not rosining, I find that I could actually rosin my bow every third time I play and still have acceptable results.